It's still snowing, but I can see the moon. 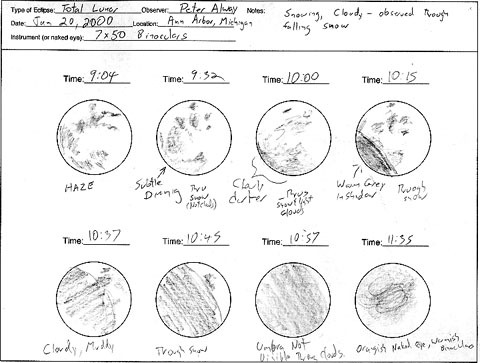 One night many years ago, I watched the first half of a lunar eclipse through the snow. I actually thought to sketch it, and the sketches happen to be online, Dated Jan 20, 2000. I guess if it weren't odd, I wouldn't remember it almost exactly 10 years later. I envy you your snow. High level winds can carry rain or snow a long way before dropping it. My mother was a climb leader for the Mazama Club and she used to recount one hapless climber at base camp who had decided not to pitch a tent waking every one in the middle of the night with the wail "It *can't* be raining; the *stars* are shining!" I think that was the case here yesterday. Wouldn't surprise me if the snow we got actually started somewhere around Iowa and the wind just carried it along. I was plastered with snow from just a short walk across campus last night. Then tell Roper to pull up his pants.